HCM City (VNA) – Secretary of the Ho Chi Minh City Party Committee Nguyen Thien Nhan has asked UNESCO Director-General Irina Bokova to increase cooperation programmes to support the city in enhancing human resources quality. During a meeting with the UNESCO leader in the city on August 26, Nhan proposed that UNESCO assist the city in implementing research programmes on impacts of sea level rise and salinity in Can Gio Biosphere Reserve. 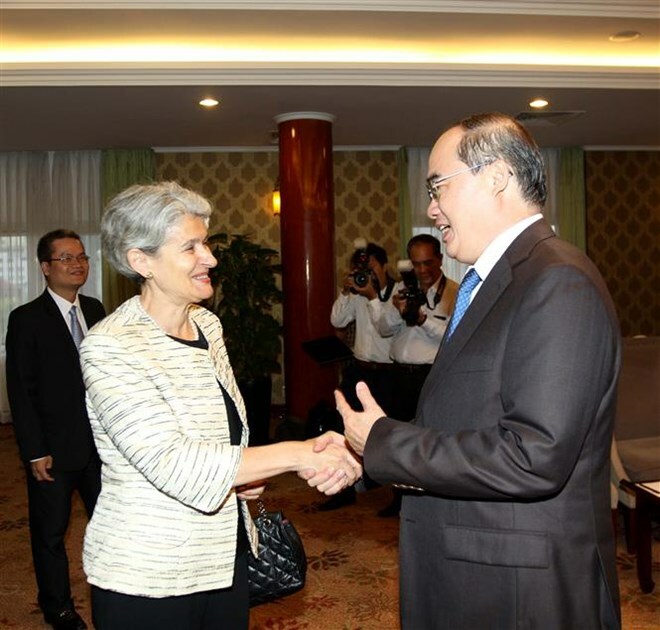 Nhan thanked Bokova for supporting Vietnam in implementing cooperation activities with UNESCO, contributing to the growth of Vietnam, including Ho Chi Minh City. He held that the third visit of Bokova to Vietnam shows the goodwill of UNESCO to Vietnam, especially through the signing of an agreement on the formation of the two centres of mathematics and physics under UNESCO’s sponsor. For her part, Bokova said that her visit is a chance for UNESCO and Vietnam to review their cooperation and discuss plan to expand collaboration in the future, especially in areas of innovation, cultural management, and environment research. UNESCO always wishes and is willing to cooperate with Ho Chi Minh City in improving creative human resources quality, and work closely with local scientists and experts in preserving the Can Gio Biosphere Reserve, said Bokova. She said she is impressed with the heroic history and dynamic development of the city, holding that the city has high potential in becoming a member of the UNESCO network of creative cities. She pledged to share with the city experience and ideas in urban management and development.